U.S. General Leading Libya Effort 'Follows Trouble' Gen. Carter Ham is leading the military operations just 10 days after he took over U.S. Africa Command. He is used to tough assignments: Prior to Libya, he assessed the impact of gays and lesbians serving openly in the military; before that, he investigated the deadly shootings at Fort Hood, Texas. 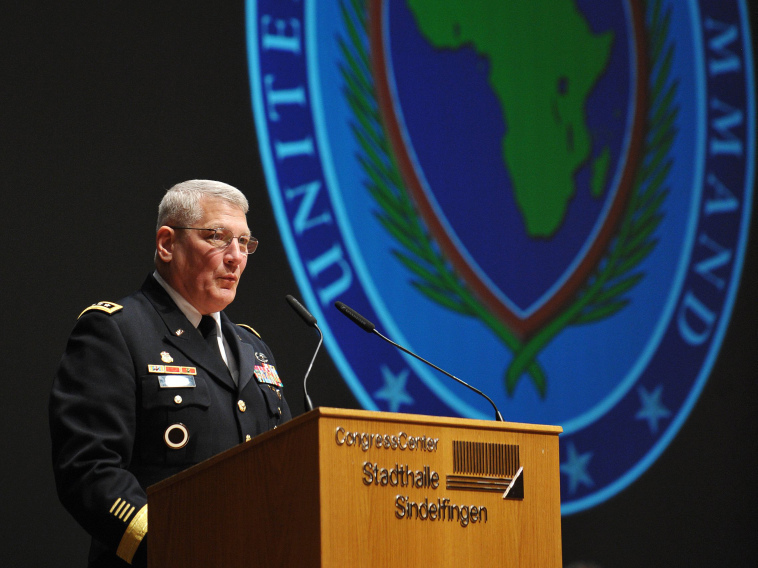 Gen. Carter Ham takes over as head of U.S. Africa Command, near Stuttgart, Germany, on March 9. Ten days after he took the job, Ham was in charge of the military operations against Libya. Gen. Carter Ham, the American officer in charge of the Libyan military operation, heads U.S. Africa Command, a job he started just 10 days before attacks against Libya began. But Ham is used to tough assignments. They say everything comes in threes. Here's Ham's trifecta: A couple of years ago, the Pentagon turned to him to investigate the shootings at Fort Hood, Texas. Ham's finding: Army officers failed in their oversight of the alleged gunman, Maj. Nidal Hasan. When that investigation was over, Ham took on challenge No. 2: Assess the impact of gays and lesbians serving openly in the military. Ham's conclusion: It'll work. "I don't think trouble follows him — I think he follows trouble," said retired Lt. Gen. John Sattler, who served with Ham in Iraq and later at the Pentagon. Sattler says he isn't surprised that officials hand Ham these assignments. "I think when tough things come up ... the folks who know him put him in there to go ahead [and] bring him to some positive conclusion," he said. Ham is a rarity among four-star officers because he started out as a private. He was a paratrooper with the 82nd Airborne Division in the early 1970s before going to college and then becoming a second lieutenant. Ask people about him, and you get the standard answers: regular Joe; the kind of guy you can have a beer with. Retired Army Maj. Gen. Bob Scales says it's true. "He's highly respected by soldiers simply because of his personality," Scales said. "He's probably one of the most un-general-like generals we have at the four-star level in the Army today." Ham got his first combat command in 2004. He spent a year in Northern Iraq. During that tour, just before Christmas, a suicide bomber detonated an explosive inside a mess tent, killing 22, including 18 Americans. Ham arrived on the scene minutes after the blast. A couple of days later, he described what happened. "What we think is likely, but certainly not certain, is that an individual in an Iraqi military uniform, possibly with a vest-worn explosive device, was inside the facility and detonated, causing this tragedy," Ham said at the time. Ham called it the worst day of his life. A few months later, he returned home from Iraq. But he couldn't forget that day. He couldn't sleep. Loud noises startled him. He had mood swings. He talked about his experience on CNN a few years later. "I was withdrawn; I wanted to still be there," he said. "I felt like what I was doing was not important because I had soldiers who were killed. It's not a matter of letting go; I don't want to let go." This was unusual. Soldiers didn't admit to problems. Ham was among just a few senior officers who sought help for post-traumatic stress disorder. By going public, he showed the way for countless soldiers. "They now have the courage to follow his example because he took the time to lay that example out there," Sattler said. These days, Ham oversees the Libyan campaign from his headquarters in Stuttgart, Germany. He has to translate political goals into practical military action. It's complicated. Ham says U.S. and coalition pilots have to protect civilians but not become the air force for Libyan rebels. "These are situations that brief much better at a headquarters than they do in a cockpit of an aircraft," he said. The U.S. hopes to hand off responsibility for the Libyan campaign soon. That doesn't mean Ham's tough jobs will end. He'll keep running Africa Command, which means everything from pirates to humanitarian missions and, eventually, the aftereffects of the war in Libya.